The mission seemed pretty straightforward. 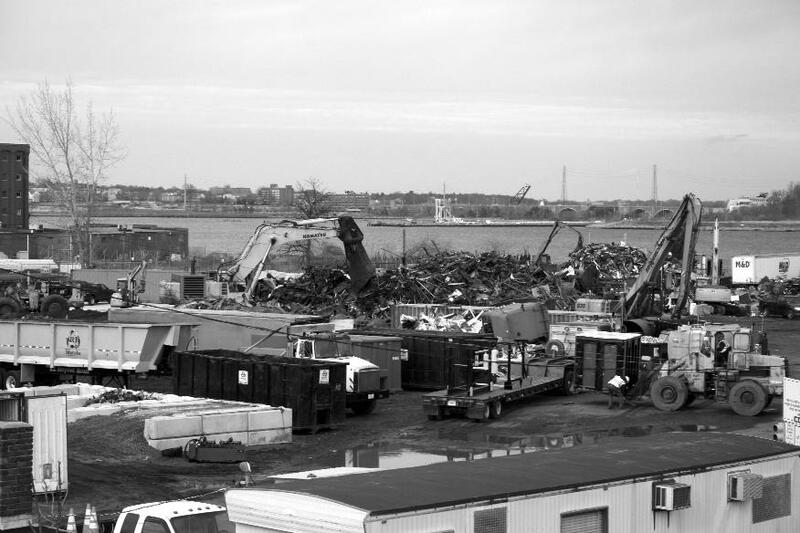 Three years ago, a new company called Rhode Island Recycled Metals set up shop on land adjacent to theProvidenceRiveralongAllens Avenue. In the summer of 2009, it had purchased the Juliett 484, known to most simply as The Russian Sub. The vessel had been berthed half a mile up the river at Collier Point operating as a museum, until it sank in a violent storm in 2007. The company successfully applied for permits from the Rhode Island Department of Environmental Management and the Coastal Resources Management council to scrap the sub at its waterfront operation. But that operation grew – quickly and substantially. 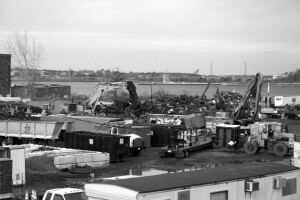 “The activity became an on-the-shore recycling, car crushing and scrap operation in addition to the scrapping of the sub,” said Jonathan Stone, executive director of environmental watchdog group Save The Bay, which began to investigate after receiving complaints from neighboring businesses along the waterfront. “We never saw a permit request to transform that single, temporary operation into a year-round perpetual ship breaking operation,” he said. Save The Bay discovered that D.E.M had cited Rhode Island Recycled Metals in the summer of 2010 for storm water and hazardous materials violations. Then, a year later, issued a Notice of Intent to Enforce. 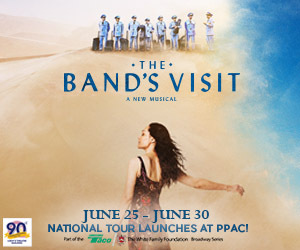 In the fall of 2011, inspectors visited the site on a monthly basis, repeatedly noting in reports that the owners had not made the changes they had pledged to implement. Meanwhile, the company continued to expand and advertised, soliciting the public to bring in marine vessels, cars, catalytic converters and household appliances. The company offered cash on the spot. Stone says, every time it rains, all of the contaminants associated with a scrap yard make their way into theProvidenceRiver. And he wanted to know why. So, in November, he wrote a sternly-worded letter to the directors of both the D.E.M. and C.R.M.C asking why the agencies had not issued a cease-and-desist order. D.E.M. Director Janet Coit, last month, sent Stone a letter saying that the agency has been working with the company, but because the matter is “under investigation,” she really couldn’t say much more. A department spokesman told The Hummel Report the same thing. Rhode Island Recycled Metals general manager Edward Sciaba Jr. sent D.E.M. a detailed list, in November, of improvements the company plans to make, nearly a year and a half after the state said it planned to enforce the citations it had issued for pollution discharge violations. Sciaba tells the Hummel Report he is doing everything the state has asked him to and is waiting for the “weather to break” to implement additional pollution-containing measures. The Hummel Report, though, has found that this is not the first time Sciaba has run afoul of environmental regulations. The Boston Globe reported that the nonprofit citizens group, Clean Water Action, filed a civil suit inMassachusettsin 2010 against Allied Recycling Center Inc over conditions at a scrap yard inWalpole. That company is owned by Edward Sciaba. The suit raised many of the same concerns: alleging the company was not properly containing untreated storm water that was being discharged to wetlands adjacent theNeponsetRiver. The group eventually settled with the company when it agreed to implement changes at the facility – paying $25,000 to the Neponset River Watershed. InRhode Island, Save The Bay’s Stone says he is frustrated and baffled that the D.E.M. has not taken more decisive action. “A decision was made by the D.E.M. to, as required under the Clean Water Act, to issue a permit to the company – to conduct these operations – and the permit covers things like retaining and treating runoff from the site., so you don’t have polluted water running into the Bay, which is very common in a scrap operation because there’s a lot of dirty material,” Stone said. In fact, the company has been cited not only by D.E.M., but by the U.S. Coast Guard, which found an oil spill from the Russian sub on theProvidenceRiverafter it was moved downriver to be dismantled.